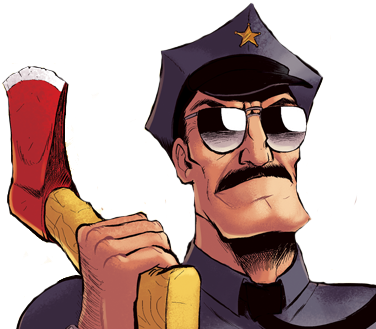 For anyone wondering, yes, Axe Cop only slept for two minutes. Last week, I mentioned that I’ve come up with a pretty solid inking technique in Manga Studio and said that if anyone wanted to know the process I’d fully detail it. It got a couple of responses, so here we go. These instructions are for Manga Studio 5 or EX5. If there’s some way you can make it work for your inking program, do it up. Before you begin, go to Manga Studio > Shortcut Settings and in the Main Menu settings area, find Transfer To Lower Level. Set its shortcut to Cmd + F. You’ll be using this function a lot, and this command will make the process much quicker for you than clicking the button on the Layer palette, seen above. 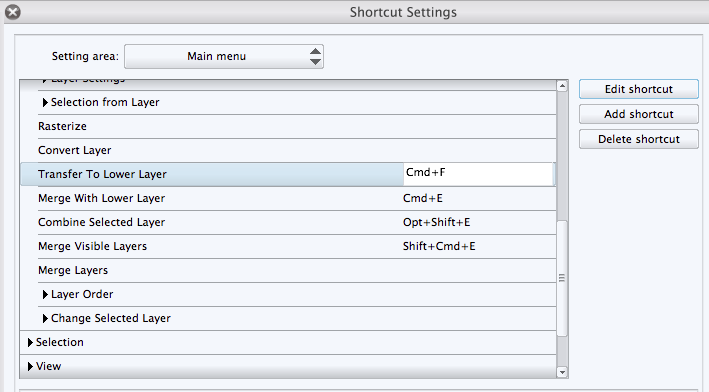 Note that I use Mac, so PC users substitute Cmd with the Ctrl key. 1. Have your pencils on a layer. Set the Expression Color to cyan and lock the layer. Expression Color is a very useful setting in the Layer Properties palette. It applies a lightening color to everything in the entire layer, but not permanently- meaning that if you click it off again, the image is normal. You’re using it as a way to see between your layers while you work. 3. Set the expression color of Finished Inks to red. 4. Begin inking, in black, on the layer Working Inks. Hit Undo frequently and redraw a line as often as it takes to get the line you want. Remember that you can change your brush size on the fly by holding Option + Cmd and dragging your pen to find the desired size. This keeps things moving so much more quickly than clicking over to the brush palette and sliding the brush size slider. Also hit the R key to rotate the page freely as needed. 5. When you have a chunk of inking you’re happy with, hit Cmd + F. You’ll see the inking turn red as it moves to the Finished Inks layer. 6. When you have overlapping ink lines at corners and edges, erase at will on either inking layer until you get the desired effect. Hitting the C key will set the color you’re drawing with from black to erase. This keeps things moving somewhat more quickly than switching over to the eraser. Hit C again and you’re back to black. 7. Repeat steps 4-6 until you’re done inking. 8. Delete Working Inks and click the Expression Color button for Finished Inks to turn it off, and to turn the red lines to black. You’re done! I hope some of you find this helpful. It’s really streamlined my process quite a bit. To think that just a year ago I was inking on paper, erasing pencils, scanning, and cleaning up the mess in Photoshop. I’ll never go back. Charlotte: “So go to sleep. The kids are planning to stay up until midnight tonight and then camp out in the living room in Amelia’s new Spider-Man tent that she bought with her Christmas money. Amelia’s a huge Spider-Man fan. Everyone got her Spidey stuff for her birthday and Christmas (I got her a full costume, she loved it) and she still bought more on her own. It’s pretty awesome. Anyway, I’m predicting that Amelia will have passed out by 10:30, and Charlotte will be a zombie by 12:20. They always think they’re going to go all the way on these late nights they occasionally have, but they never quite make it. This year’s been good for me, and I hope 2014’s even better. Have a great New Year’s Eve, everyone, and a happy 2014. Next week, it’s a showdown on the street, good guys vs. bad. Heads are about to start getting seriously chopped. That tv station cracked me up–awfully nice of them to warn the badguys of Axe Cop’s revenge. I had never heard of ‘Axe Cop’ until I just now heard Jian Ghomeshi interview you on CBC. I’m still smiling. I’m a 55 year old grandmother of a 2.5 year old, and I’m re-learning the wonder of small children. I’m in awe of what you are doing. Thank you for bringing joy to my heart with your comics. Great work Tom! 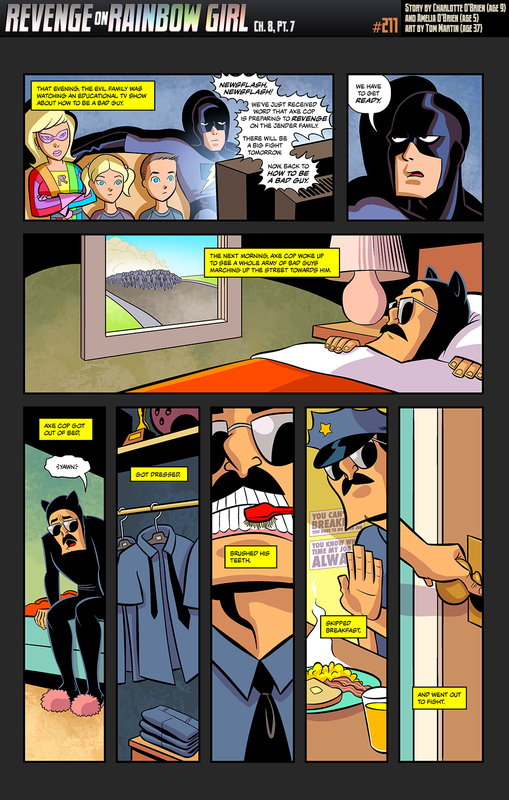 Can we expect to see a cameo from Super charlotte or the now handless Magma Girl? Thanks! Magma Girl is sitting this one out, and Super Charlotte doesn’t have a role at all, but she mayyy pop up in the background of a super huge mega-fight.